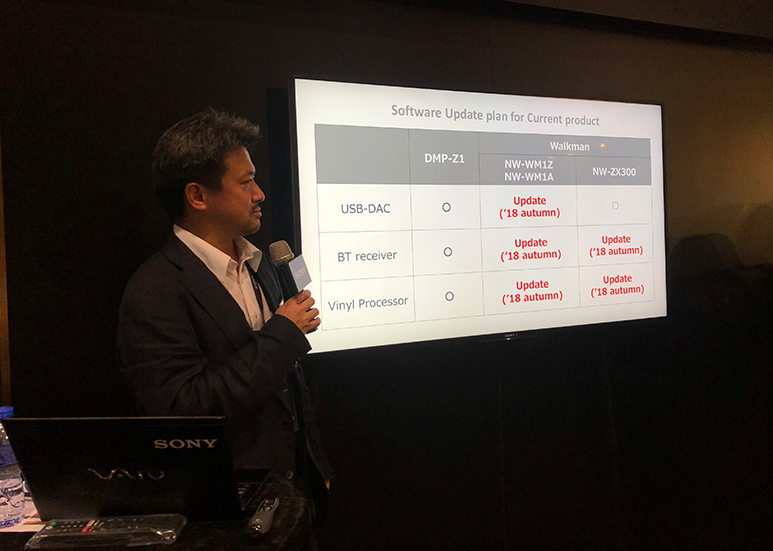 Sony Walkman® Project Leader / Senior Electrical Engineer Tomoaki Sato has during the public session on the new DMP-Z1 at the Hong Kong High-End Audio Visual Show 2018, announced that users of the Sony NW-WM1Z, NW-WM1A, and NW-ZX300 can expect a firmware update in Autumn 2018. The autumn update will bring alignment of Sony’s portable offerings with that of the carryable DMP-Z1 providing USB-DAC, BT receiver, and Vinyl Processor functionalities to the NW-WM1Z and NW-WM1A while NW-ZX300 will add BT receiver, and Vinyl Processor functionalities as it already features USB-DAC capabilities. Newly developed by Sony, the Vinyl Processor feature recreates via some clever processing, the acoustic phenomenon unique to vinyl playbacks such as the tone-arm resonance, tiny surface noise and the rich sound from the vibration by acoustic feedback from the speakers to the turntable.